OLD PARKED CARS. 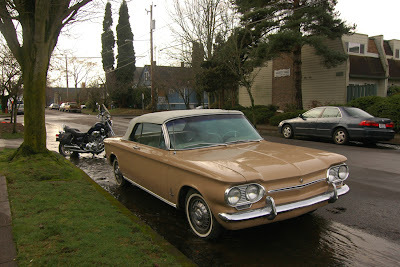 : 1963 Chevrolet Corvair Monza 900. 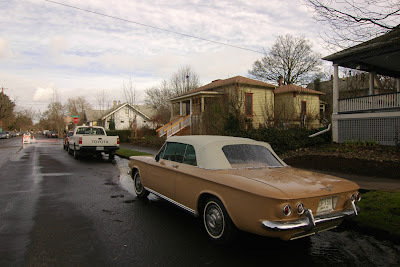 1963 Chevrolet Corvair Monza 900. These have never been my favorite car to look at, but that color with the white ragtop is working for me. Body is in good shape ! The Corvair looks like some computer graphic/drawing placed within the third picture. So nice. I had forgotten about the chrome trim at the fuel door. Lovin' the wire wheel look hubcaps too. And those tail lights. Never too many Corvairs here. 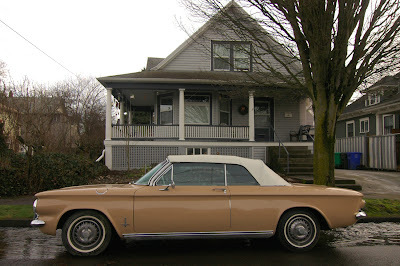 @Jim: Pretty sure these cars were air cooled, so no radiator, no coolant. Corvairs from the beginning to the end of their production were always air cooled. I want to see more comments from you, Jim.